The Galapagos Islands were discovered in 1535 by the Spanish Bishop of Panama, Fray Tomas. He sent back reports to King Charles V of Spain of incredibly tame wildlife, huge tortoises and unusual iguanas. The islands were formed by volcanic eruptions about 5 million years ago and some of the volcanoes in the western part of the archipelago are still active, so new land is still being formed to this day. The islands gradually move eastward towards the mainland. Today the islands, which are 600 miles off the coast of Ecuador and straddle the equator, are still home to a remarkable range of life that seems to have no fear of man. Due to the remoteness and distances between the islands, some of the plants and wildlife are found nowhere else on earth, and some species and subspecies are unique to individual islands. The islands are a National Park and there are 70 visitor landing sites and 75 marine visitor sites within the Galapagos archipelago. Some of the best known wildlife here includes the red-footed and blue-footed boobies, frigatebirds, flightless cormorants, the Galapagos waved albatross (on Espanola island), marine iguanas (the only sea-going lizard in the world), and of course the giant Galapagos tortoise. The islands all have nature trails marked out to avoid disrupting the wildlife, and you will be following these when you take trips on to different islands with your naturalist guide. Nearly every itinerary also includes time on Santa Cruz Island where you can visit the Charles Darwin Research Centre, and hike in the highlands where giant tortoises are found. As well as enjoying the cruise, you may have an opportunity to go swimming and snorkelling, perhaps even being joined by sea lions at times! Some of the yachts and catamarans also have kayaks you can use. Due to the distances between these islands some of the long journeys are done at night so that when you wake the next morning you are already at another landing site. But when you are cruising during the day you often see dolphins swimming alongside your boat. There are 13 main islands and 7 smaller islands in the Galapagos archipelago. The largest is Isabela by some considerable size. Santa Cruz has the greatest human population and the biggest town, Puerto Ayora. 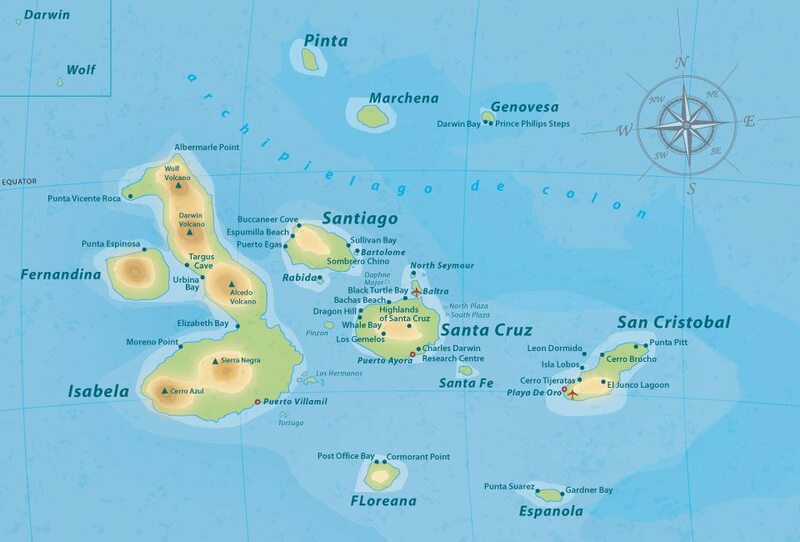 The other islands making up the main 13 are Baltra, Espanola, Fernandina, Floreana, Genovesa, Marchena, Pinta, Pinzon, San Critobal, Santa Fe and Santiago. Along with the islets, there are about 8,000 sq kms of land, spread over some 93,000 sq kms. You can see details of the individual islands and their different visitor sites by selecting them from the top menu on the right ‘The Islands’.